The San Luis Obispo City Council will soon vote on a plan to ban Styrofoam food and drink containers, a move the council majority has already endorsed. The proposed ordinance would ban the use of Styrofoam containers and cups in restaurants citywide. It would also prohibit the retail sale of all Styrofoam food and drink containers that are not encased with a more durable material. Additionally, the ordinance would require all food providers to use disposable food and drink containers that are recyclable, compostable and biodegradable. Styrofoam use causes a unique litter problem since the material is lightweight and not biodegradable, a city staff report states. Worker find a significant amount of Styrofoam during creek cleanups, according to the staff report. The council is scheduled to vote on the ordinance during its upcoming meeting on June 2. If the council approves of the ordinance next week, it must do so again at a following meeting for the Styrofoam ban to become official. 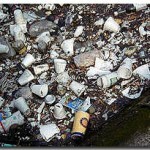 Last September, four of five council members endorsed a Styrofoam ban. Those supporting the ban included Mayor Jan Marx, Councilman John Ashbaugh and Councilwoman Carlyn Christianson. Only Councilman Dan Carpenter voice opposition to the issue. Carpenter said at the September meeting he was concerned with overregulation and that the county Integrated Waste Management Authority should take up the issue, rather than the city. Kathy Smith has since left the council and has been replaced by Councilman Dan Rivoire. Rivoire’s campaign website says he previously chaired a chamber of commerce sustainability committee and served as a member of the Climate Action Plan group. If the Styrofoam ban passes, the ordinance will take effect six months after the final adoption. An additional six-month warning period will occur after that. Violators will then face administrative fines. First-time violators could avoid the fine, though, by purchasing acceptable products to replace their Styrofoam containers. I suppose I’m off topic, therefore I’ll broaden it a little bit. I walked through the Downtown area this morning, as usual I thought I was going to heave my guts out with the filth and stench. That is what you call charming? oh well. Stop being so concerned about Styrofoam cups and band aid construction and revitalize the area, hopefully with a little content. Culturally it is representative of the Third world. Well I sure hope the actual ordinance reads “polystyrene” and not “Styrofoam.” Otherwise their ban isn’t going to really effect anything.